Modern industrial, agricultural and personal activities are taking a toll on drinking water supplies, and municipal wastewater treatment processes are not effective in removing emerging pollutants from water. CycloPure, a Northwestern University-affiliated company, has developed a solution – a first-ever adsorbent that is more effective, more sustainable and low cost. CycloPure uses high surface area polymers derived from cornstarch that act like a magnet to attract and adsorb micropollutants, which are pesticides, pharmaceuticals and components of personal care products. 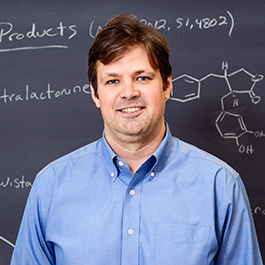 Will Dichtel, a 2015 MacArthur genius grant winner and a chemistry professor in Northwestern’s Weinberg College of Arts and Sciences, teamed up with tech expert Frank Cassou to found CycloPure in 2016. Advanced detection technologies have shown micropollutants to be pervasive in water resources, presenting health and environmental risks even at trace concentrations. Because of its versatile structure, CycloPure’s technology can be configured for use within existing industrial, municipal and domestic treatment systems. A key advantage of CycloPure’s technology is its ability to instantly remove contaminants, compared to extended contact times required for carbon-based filters. CycloPure’s innovation is a major breakthrough in adsorption technologies, designed to remove micropollutants at concentrations of one part per billion and lower. Activated carbon, developed a century ago, has limited effectiveness against micropollutants. The company has developed techniques to extend the use of its adsorption technologies to applications beyond water treatment, including the ability to embed its materials into textiles to create functionalized fabrics. This creates opportunities for odor-resistant clothing and materials, protective fabrics for industrial use and the development of masks to block the effects of air pollution.